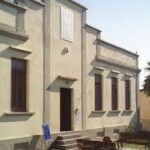 The Museum of the Madonna del Parto, just outside the walls of the village of Monterchi, is a museum for a single work, Piero della Francesca’s masterpiece, probably painted in the mid-15th century for the small Church of Momentana, now a cemetery chapel. It depicts the visibly pregnant Virgin with her hand on her stomach in a gesture of great naturalness that blends with the majesty of the entire composition. The angels open a tent, the tabernaculum that contains Mary who, in her turn, is the tabernacle for the body of Christ. An attractive yet unlikely hypothesis is that it was painted at the death of the painter’s mother who was originally from Monterchi. Also on display in the museum is the Madonna del Latte, dating from the 14th century, which was found under Piero della Francesca’s fresco. 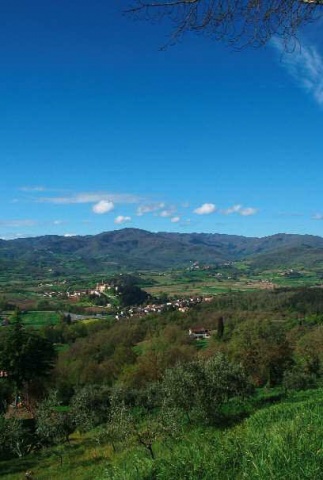 After the Council of Trent, the altar of the Madonna del Parto was no longer officiated, most likely because the subject was no longer considered appropriate. Thus, the masterpiece was only rediscovered in the late 19th century. 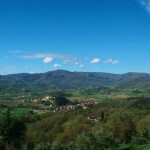 It was so worshipped by Monterchi’s inhabitants that, for fear that someone might take it away, they chased off both the restorer Domenico Fiscali, in charge of its restoration after the 1917 earthquake, as well as the art historians Ugo Procacci and Mario Salmi, who were determined to put it in safekeeping away from the bombardments during the Second World War. 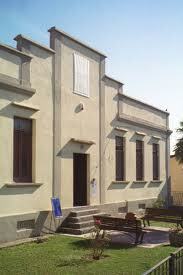 Apart from the Museum of the Madonna del Parto in Monterchi you can also visit the Museum of Weights and Measures. Open to the public since June 2012 in the halls of the 16th-century Palazzo Massi-Alberti, it was created with Velio Ortolani’s private collection, one of the most important of its kind in Europe. Inside the museum, more than six hundred years of the history of weights and measures are on display, ranging from some elegant two-armed balances from the 15th century up to more modern ones, like the laboratory and the market platform scales from the last century. Already in the first half of the 14th century, realistic depictions of the pregnant Virgin Mary were in circulation In Tuscany. This iconographic subject was called “Madonna del Parto” and represents the Madonna herself, standing in a frontal position and visibly pregnant. One of the elements distinguishing it from a normal pregnant woman is the closed book resting on the belly, an allusion to the Word Incarnate. In fact, the book is the Old Testament and therefore the word of God that is incarnated through the Virgin to descend among humanity. 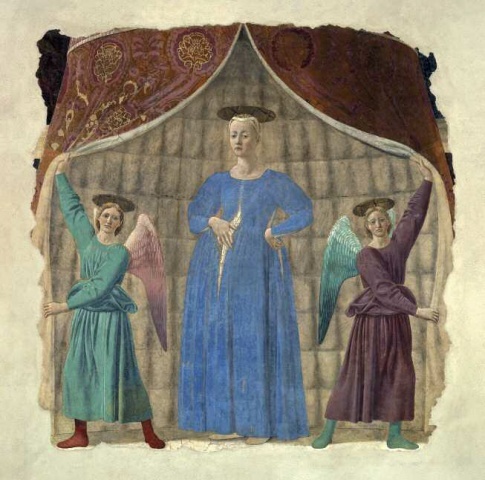 The Madonna del Parto is one of the highest point of Piero della Francesca’s art and of the Renaissance. This masterpiece was originally painted in the Santa Maria di Momentana Chapel in Monterchi, today it is situated in the Madonna del Parto Museum. It is a masterpiece shrouded in mystery, both for the choice of the site where it was painted, the place formerly elected for the devotion of divine figures protectors of fertility, both for still unknown client: This unique work of art could be initiative the master himself. 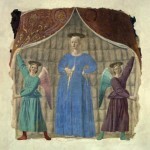 The pregnant Madonna, standing in the centre of a curtained canopy of precious brocade, shows herself to her worshippers. She stands, three quarters facing us with her right hand touching her body, with a gesture of modesty and protection but also of knowing pride. Two angels hold back the curtain of the canopy so worshippers can see the Virgin, majestic and solemn but at the same time, humble. The curtain framing the scene is decorated with pomegranate flowers, evoking the future Passion of Christ. Museum of the Madonna del Parto, exterior. 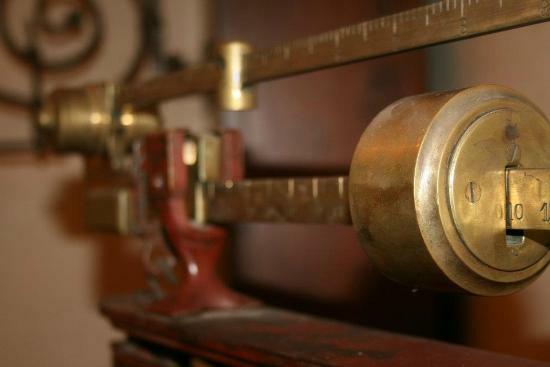 The Scales Museum came about thanks to the passion of Velio Ortolani, an extraordinary collector who has shared part of his unusual collection of scales and weights, one of the most important collections of this type in Europe regarding chronology and the number of exhibits. In rooms of the museum see around 150 objects of various types which retrace more than 600 years of the history of scales, from some small Renaissance balances to big, industrial scales from the last century. daily;: 9:00 a.m. to 1:00 p.m. / 2:00 to 7:00 p.m. 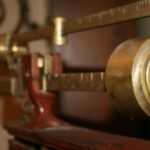 The ticket for the Museum of the Madonna del Parto allows you to visit the fascinating and unusual Museum of Weights and Measures.